North Korea appears to be struggling to control a satellite it put into orbit last week, a space expert has said. The Unha-3 satellite was launched on board a long-range rocket on 12 December, in defiance of sanctions and international warnings. Pyongyang says the device, the size of a washing machine, is working and is beaming revolutionary songs to Earth. But US astronomer Jonathan McDowell says it may be tumbling, and does not yet appear to be transmitting. "Those two things are most consistent with the satellite being entirely inactive at this point," he told the New York Times. The satellite was designed to point towards Earth, but Mr McDowell said the light coming from it was repeatedly brightening and dimming, indicating it was not yet operating as intended. "The preponderance of the evidence suggests that the satellite failed either during the ascent or shortly afterwards," he said. He told the Associated Press news agency that the the device was still completing its orbits, and whether working or not, would remain in space for years to come. While this effort at launching a satellite into orbit has gone much better than the previous attempts, most experts believe that this was not the most important purpose of the mission. The rocket technology needed to lift a satellite into orbit is similar to that required for a long-range ballistic missile. The real success of this mission, say experts, may be the fact that the three stages of the rocket fired and separated successfully, marking yet another step towards North Korea's ability to field an intercontinental range ballistic missile. Stuart Eves, principal engineer at Surrey Satellite Technology in the UK, said it was too early to say that the satellite was dead. He stressed that any spacecraft would be unstable immediately after launch, and that North Korea could be trying to rectify the problem. "Depending on how they plan to stabilise it, they may have a problem," he told the BBC. "We take typically two or three days to get a satellite stable, and we know what we're doing - whereas this is the North Koreans' first try. "It would be prudent to wait a little longer and monitor the tumble rate to see whether there's any attempt to stabilise it." However, critics said the North Korean government was likely to view the launch as a success because the real purpose was to test rocket technology. The launch last week was North Korea's first successful use of a three-stage rocket to put a satellite into orbit - a similar launch in April failed just after take-off. The BBC's diplomatic correspondent Jonathan Marcus says it appears to mark another step towards North Korea's ability to field an intercontinental range ballistic missile. Such a missile could be used to carry nuclear warheads. The rocket was celebrated extravagantly in North Korea, with a mass rally held in the capital, Pyongyang. State media credited the country's new leader, Kim Jong-un, with the success, praising his "endless loyalty, bravery and wisdom". 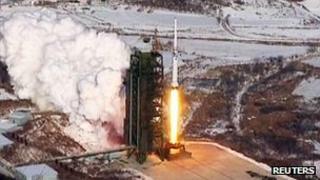 Pyongyang has said it will carry out further launches. The US, South Korea and Japan want UN sanctions to be strengthened. But China - North Korea's main ally - says any UN response should be "conducive to peace" and avoid escalating tensions.